In field or on highway, this agricultural flotation tire is rated for weight and speed. 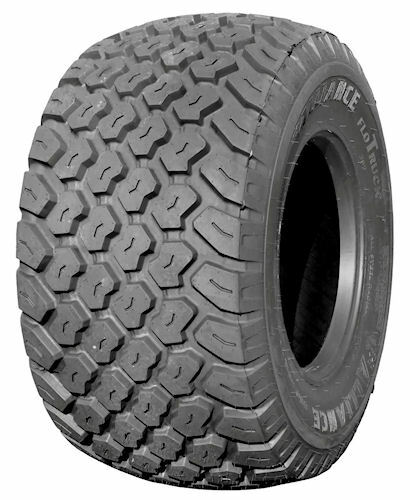 The FloTruck 382 steel-belted radial flotation tire from Alliance Tire Americas is aimed at farm wagons, carts, trucks and trailers. The 382 provides a flotation profile for compaction control in the field, and carries a highway rated speed of up to 62 miles per hour. It's rated for 6, 610 pounds and is DOT-compliant for public roads. Steel belts and a proprietary rubber compound make the 382 stand up to stubble and other field hazards and help them last longer than ever. The FloTruck 382 is available in 600/50R22.5 to fit a wide range of agricultural applications. Alliance Tire Americas is introducing the new FloTruck 382 a radial flotation tire rated for on- and off-highway use at speeds up to 62 miles per hour.